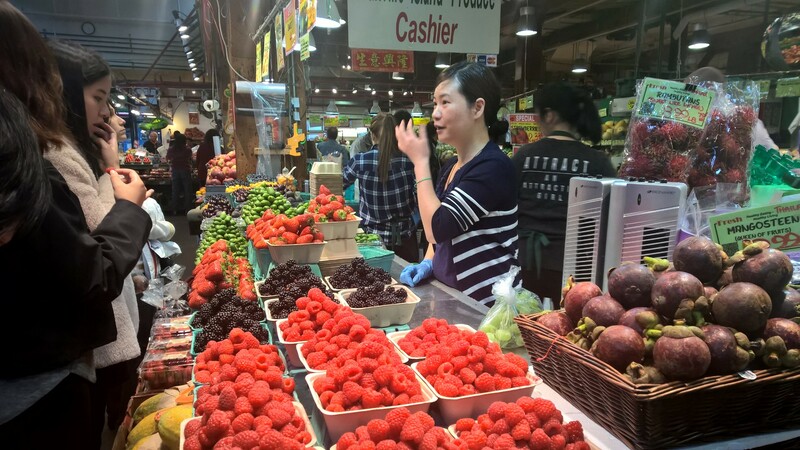 As many times as I’ve been to Vancouver, I’ve just never made time to visit Granville Island, one of the top tourist attractions here. Yesterday, I finally made it! After researching the water taxi situation, we made our way to Yaletown and caught the water taxi, a cute little boat that holds about 10 people comfortably. After a quick 10 minute ride across the water, we hopped off ($7.50 each round trip) and immediately immersed ourselves into the market. WOW-what amazing fruit including a long dark purple grape thing I had never seen before. We meandered around looking at exotic spices, breads, meats, pasta, etc. If I lived in Vancouver, I would shop here all the time! 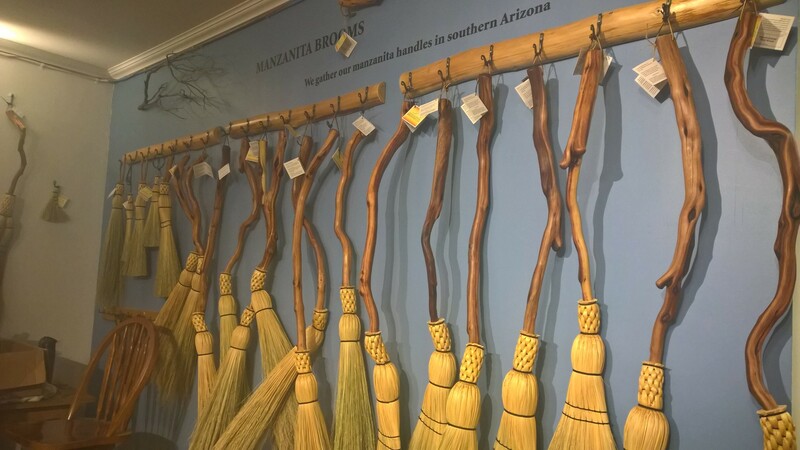 While there are a lot of touristy shops, we were able to get away from the main drag and enjoyed looking through the handmade broom store. Whether you’re riding one (no, not ME, Thom!) or sweeping away the cobwebs, they make a broom for every need and they were just beautiful. Handmade brooms for every need! 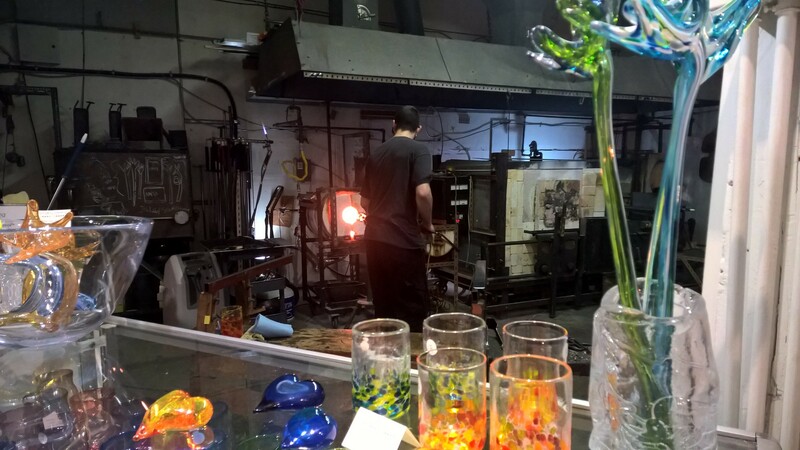 Next stop was the glassblowing shop where we enjoyed seeing the young gent blowing a colorful glass cup that unfortunately slipped off. To say he uttered a few bad words under his breath is an understatement but he was resolute and announced to those watching, “It happens.” DAMN that glass is expensive in the shop but when you see how long it takes to make it, you do understand the pricing. 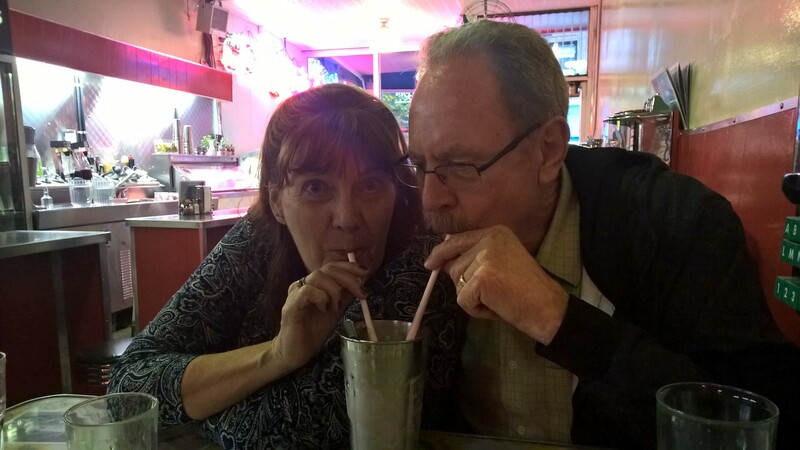 After that, we were tired and needed a drink but the distillery was packed so we decided to find the diner I had seen on Yelp with it’s magnificent milkshakes and burgers. Unfortunately, we found out that the diner was on Granville STREET not Granville Island so we took the ferry, walked awhile and finally found it in the gritty part of downtown Vancouver–right next to the TripleXXX Peep show. We only take our friends Patti and Larry to the best places! Actually, the Templeton diner had good food and we were able to introduce Larry to poutine. YUM! Of course, when Larry thought we said another word similar to poutine, we almost spit out our drinks. Correcting him and cautioning him to NOT use that word again in public, we proceeded to enjoy those fries covered in white cheese and thick rich gravy along with our eclectic mix of salads, hamburgers, coconut chicken strips with chili sauce, and Portobello mushroom sandwich plus, of course, candy appletinis for Patti and I and milkshakes for the boys. Interestingly, they make their appletinis with vodka, peach schnapps and apple juice and they were delicious, served to us in wine glasses because all their martini glasses were broken. Enjoying the jukebox and good company, we had an excellent first day in Vancouver! Today we are taking a walking tour of Gastown and tomorrow we will explore Chinatown. Looking forward to a relaxing foot massage if we can find a place!